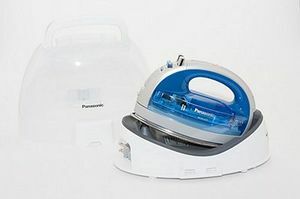 This lightweight cordless 360 Freestyle Iron by Panasonic comes in its own heat-resistant carrying case for easy traveling to quilt retreats or on trips! It has a detachable water tank, with a built- in, lifetime anti-calcium build-up cartridge, so you can use tap water. It features a double elliptical soleplate (points on both ends) trademarked by Panasonic, automatic- shut-off feature, (after 10 minutes) electronic temperature control, and anti-drip system. It even steams in the vertical position. Won the Good Housekeeping Seal of Approval. 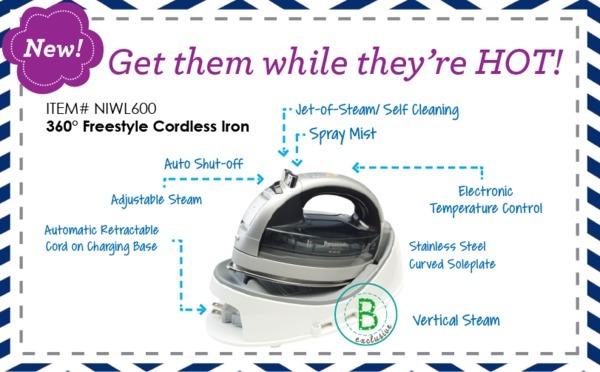 Iron heats up in 1 minute to maximum (392 degree) temperature, after removing from base-you have 2 minutes, 30 seconds of ironing at set temp, before iron begins to cool You may iron for a full 6 minutes before the iron reaches low. 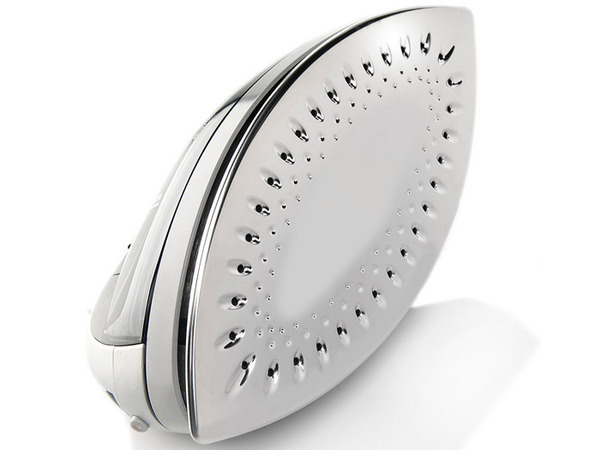 Every time iron is replaced on base, it reheats. Base features an auto-wind cord reel. This iron is perfect for quilters especially for applique methods. Also features adjustable steam, spray mist and jet of steam for tough wrinkles or self-cleaning. 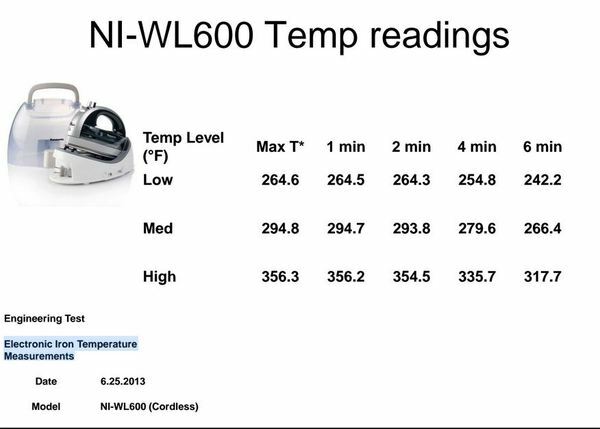 Easy touch system to select desired temperature. Anti-Drip System provides a water seal inside the iron to protects fabrics from water spotting. Our electronic sensor automatically shuts off the iron after 10 minutes if it is left in the base. An anti-calcium system prevents clogged steam vents by reducing the sediment build-up in the vaporizing chamber of the iron. 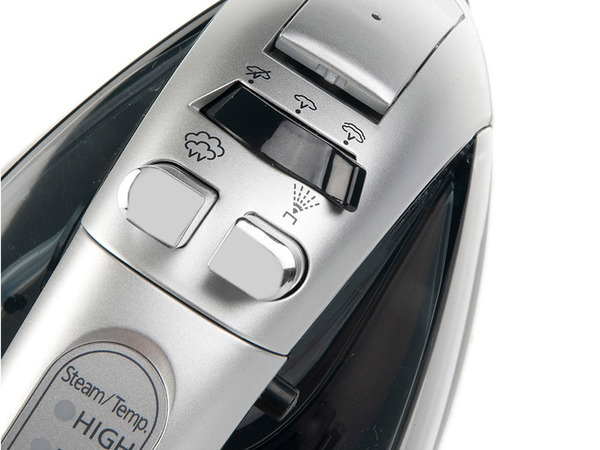 With our steam/dry selector, you can select to steam or dry iron by simply pushing a button. 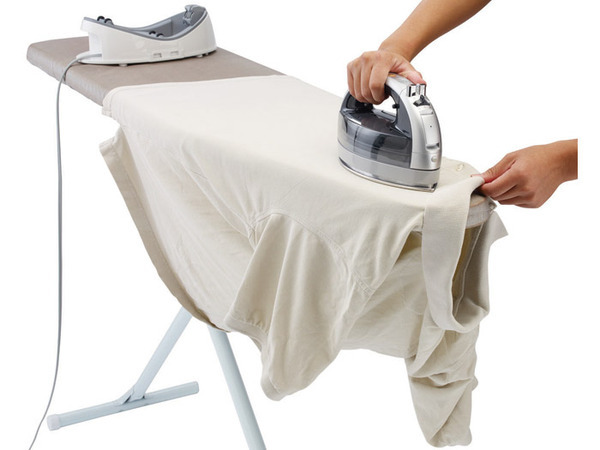 A powerful burst of steam helps remove stubborn wrinkles when ironing. It also helps clean the steam vents on the soleplate after ironing. Spray Mist the Wrinkles Away! The spray mist button helps eliminate stubborn wrinkles by directing extra moisture where necessary. Dimensions: 5-1/8" x 3-15/16" x 8-11/16"
Curved on both ends to allow movement in any direction. Contains a series of round indications that trap pockets of air between the soleplate and the fabric that lets the iron glide smoothly for crease-free results.